The Patrick F. Taylor Foundation Object Project is a new learning space that explores "everyday things that changed everything." The refrigerators section of Object Project includes period hands-on cookbooks from the 1930s to the 1960s. For insight on what these recipes taste like in practice, I spoke with Ruth Clark, the creator of a blog called "Mid-Century Menu." In 2009, she began an experiment: Make one mid-century recipe a week and taste-test it. As she continues to explore new recipes and perfect her favorite mid-century meals, Ruth says she's learned a lot about food trends, unusual ingredients, and even what food can reveal about American culture at a specific time. Caitlin: Hi, Ruth! So I know the majority of these dishes are inspired by authentic mid-century cookbooks you've gathered. How did that collection start? Ruth: It started when I was about 13. I inherited my grandmother's cookbooks and a lot of her cooking equipment. One of the things was a vintage lamb cake pan, which I very much enjoy and use to make a lamb cake every Easter. I started reading the cookbooks like they were novels; I'd read them before bed. I kept running to my mom with questions: "What does this mean? How does this technique work?" There were things I had never seen before, and I think that started my interest in learning about the era. Caitlin: Do you think the mid-century recipes have more colorful descriptions compared to today's cookbooks? What makes them so riveting? Ruth: A lot of these cookbooks have introductions and little suggestions for how you can serve things. I was interested in the different lifestyles they helped convey. There are also some unexpected names for ingredients, like 1920s and '30s recipes referring to avocados as "alligator pears." Caitlin: What have you learned from doing this project so far? Ruth: I've learned that cookbooks themselves are a great record of an era. Cooking can be a product of a time period, and at the same time, it's universal. There have always been ingredient trends, equipment innovations, and preparation and presentation styles. I really like watching everything evolve throughout time while also seeing the similarities. Caitlin: That's a theme in Object Project, too. There are some fascinating evolutions in refrigeration, like the advent of ice cube trays and how they were a new innovation that people used to make these trendy chilled beverages. Ruth: It was exciting! We have this new technology that becomes a trend. That's what I find interesting in exploring these recipes over time—how certain things become trendy, and then sometimes fall by the wayside. Caitlin: What do you think mid-century food and cookbooks say about the times in which they were popular? Ruth: In the 1940s, rationing played a big role in how people ate. And I think the '50s is kind of the antithesis of that. There was a lot of rich food, a lot of big parties; food presentation and garnishes were very intricate. Sitting down at the table and having dinner became a cultural phenomenon. Caitlin: We've seen a number of recipes in our Object Project books that use gelatin in molds of various shapes. Are you tired of Jell-O yet? Ruth: I definitely think that this project has made me appreciate Jell-O more. Before, if you had asked me what my favorite gelatin dish was, I would've said, "None." But now I can say, my favorite gelatin dish is "Under the Sea" salad. It's a Jell-O brand creation that includes lime Jell-O, cream cheese, and canned pears. How does that sound? Caitlin: Ooh. I don't feel good about that. Ruth: Right? It's the weirdest thing. And I thought to myself, "I'm going to be horrified." But I ate it, and it was surprisingly good. Caitlin: What's one of the best things you've made? Ruth: The best one was "Black Magic Chocolate Cake." This was based on a chocolate cake recipe that I believe originated with Hershey's in the 1930s. The secret ingredient in the original recipe was a cup of cold coffee. And I found a handwritten edit from the 1970s that substituted the coffee with a can of condensed tomato soup. You'd think that would be the biggest mistake ever, but it was probably the best chocolate cake I've ever made. Caitlin: Have you found yourself incorporating anything you've learned from mid-century cooking into your day-to-day meals? Ruth: I do, actually. There are a lot of techniques I've learned through this project that have made me a better cook. One of the things I enjoy most is being able to make a white sauce, no recipe, whenever I feel like it. I've made various white sauces so many times because they're so common in mid-century cooking. I can crank out mac and cheese in no time flat, which is great when you have a toddler. That's a life skill. Caitlin: Agreed. As a vegetarian, would I survive on a mid-century diet? Ruth: You would! If you could eat cheese, dairy, and eggs, you would be fine. Casseroles were often made with vegetables and served as a side dish, and they resembled something that we might now serve as a main course. If you were vegan, you would be in trouble in the '50s but probably okay in the '40s. The cooking literature of the '40s is one of the few places where I've seen soy mentioned. Because of rationing, people were interested in making meat substitutes. So there was nut loaf, like cashew loaf, and also loaves made of soy and oatmeal. Similar recipes don’t reoccur regularly until people were getting into the health kick of the '70s. Caitlin: One last question for you: Do you have any suggestions for hosting a mid-century dinner potluck if, say, the Object Project team decided to try it out? Ruth: My biggest suggestion would be to keep an open mind. Everyone should agree that they are going to try one bite of every dish, unless they have allergies or other restrictions. Make sure someone brings cocktails, of course. And I would definitely have someone make the "Black Magic Chocolate Cake." Caitlin: I'll bring the nut loaf. Thanks, Ruth! 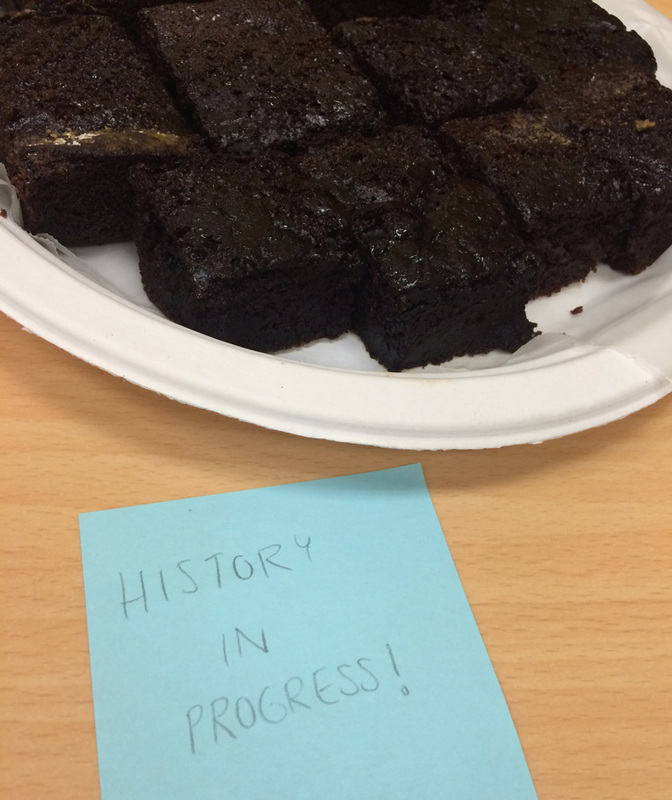 *Update* After reading this post, the museum's business program manager Kathy Sklar was inspired to try making the "Black Magic Chocolate Cake" herself! She brought some in to share, and we all agreed it tastes delicious. Caitlin Kearney is a new media assistant for the Taylor Foundation Object Project. She is a student in the Museum Studies program at The George Washington University. Previously, she has blogged about the history of Tabasco.